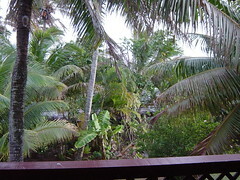 The partner and I just got back from a week in Rarotonga, and, well, it wasn’t all that thrifty. But there is a very good reason for that. Second Chef (my partner) is heavily pregnant and we just needed things to be easy. Consequently we stayed at the Rarotonga Beach Resort. As I say, not so thrifty. We did do the math though, and with the travel agents offering resort packages the costs were kept down significantly. If you factor in all the freebies the resort includes (like the three breakfasts I ate every day, alleviating the need for lunch… yay for buffets), then it’s expensive but not too bad. So how did we cover costs? No mortgage. This means that we save a fair amount of money ordinarily. It also means no stress trying to produce 70% of our incomes each fortnight to pay huge interest on an asset we could rent from someone else for half that. get your driver’s licence and hire a scooter to get about the island. the buses are reliable, but when you can have a scooter for as little as $80 for 6 days you’ll find the costs are comparable. All in all petrol cost us $12, less than two return tickets on the bus ($14). We did this, and it was worth it, if not only for the convenience. Or, hire bicycles for about the same. cook for yourself. The range of ingredients is very similar to New Zealand, so you shouldn’t be too much out on a limb there. Any bought meals cost a minimum of $40. You’d have to be spending like a drunken sailor to spend more than that on ingredients even at the very small local stores. And there you go. Some tips to enjoy an exotic South Pacific Island holiday, on significantly less than $300 per day, and all on your savings from not owning an albatross like a mortgage. Thanks for the info. My husband and i are travelling for first time and were not sure what to do. I like te idea of not being too touristy and relaxing.